Where do I begin? I have so much to say about The Philippines! I hadn’t realized how huge of a country Philippines really is until I observed it from the sky. It’s an island with a thousand other islands within other islands. Palawan Island, for example, is an archipelagic province which itself is composed of roughly 1,780 islands and islets. One of these is our destination, Coron Island. A natural beauty of tropical paradise. It’s where island life doesn’t get anymore authentic than this. In fact, Palawan has been named “Best Island in the World” year after year by top travel publications, from Travel + Leisure to Destinations of the World magazines. What I admired most is that the locals strive hard to maintain the islands, ensuring these pieces of paradise remain untouched and intact with the onslaught of tourists. And they most certainly are doing a fantastic job. We rested for the night in Manila after a long flight from Kuwait, first at the Conrad Hotel before continuing our long journey to Palawan, the land of secluded beaches and hidden lagoons. When we got ready for the adventurous trip that awaited us the next morning, we were driven to the take-off spot to board a small private seaplane called Air Juan with just two co-pilots and the both of us. At first I was pretty nervous, as the ride itself was turbulent like something out of an Indiana Jones movie. But the notion of being drifted off to a secluded island out of the thousand other surrounding ones in the middle of nowhere was romantic. Watching the breath-taking views of the diverse formations of islands below in their various shades of azure, turquoise and cyan blue, tensions gradually melted away! Then appeared our first glimpse of the beautiful Coron Island, a narrow strip of land encircled by pristine waters and dotted with houses. This shade of blue is out of this world! After some time exploring the land and taking in its beauty, we began to plan our adventures! To gear up for the day, we re-energized with a wholesome filipino-style breakfast that mostly relies on a symphony of sweet, tangy and sour flavors. We had some garlic fried rice with egg and a side of corned beef, delicious Pancit Canton noodles (which is their take on the Chinese Chow Mein), baby corn, and a popular Pinoy dish called Danggit, which is fish that is split open, salted, and dried under the sun, usually served with a vinegar dip. Typically, everything is eaten with steamed rice. Overall, I very much relished filipino cuisine. It’s a blend of both the East and West, mainly strongly influenced by the Spanish, American and Chinese. On speedboat, we reached the fortress-like rocky cliffs guarding the elusive Baraccuda Lake. Doesn’t the name itself sound intimidating? Makes you think there is something mischievous and dark lurking there. We threw on our snorkeling gears and were guided by our tour diver to a tricky, narrow entrance of rocky paths and wooden ladders, eventually emerging onto a hidden emerald lagoon surrounded by limestone walls. From there, we swam freely around the lake exploring its features as the tour guide told us it’s many tales. He mentioned that if we were lucky, we might have the chance to encounter the one resident after which the lake was named, said to be skulking in the shadows of the lake’s 35 meter cave – The razor-jawed Baraccuda fish. Peering down below, the water is brackish, making the bed of the lake almost disappear into oblivion. Suddenly, I see our professional diver cueing us to look down. And “luckily” there it was, THE BARACUDDA 🐟 , lurking curiously around us from a distance looking like a silver predatory torpedo. He told us that it’s usually pretty rare to spot one, as they mostly hang out in the 35-meter cave below. Instantaneously, everything that I had read about this “mythical” shark-like fish came flooding to me, like that fact they they sometimes jump into people’s boats and can bite off a considerable chunk of human flesh in a lightening-fast ambush which only fueled my fear. I felt at ease when the diver told us that they rarely bother humans and there’s no real reason to feel threatened. However, he did also mention with a slight smirk, that they appear when hungry and hunting for prey 😲 …. Once taking the plunge into the waters, what’s interesting about the lake is its thermocline. Barracuda Lake consists of layers of fresh and salt water, which makes this former volcanic crater home to one of the most unique eco-systems in the world. The water temperature is perfect. However, when the diver told us to slightly descend and pull our bodies down, that is when we felt a strange sensory experience. Because the fresh and salty water exist in harmony, our lower body hits the saline part where the temperature rises. As a result we found our upper bodies in the cold layer and the lower bodies in the hot area! What an unusual sensation I must say! The difference feels more extreme the deeper down you go. Navigating past it’s towering limestone formations, the Kayangan cove was surrounded by a couple of boats filled with people on Island-Hopping tours. Getting to Kayangan Lake required a long hike up the steep slope through a wooden stair way. Being the cleanest and clearest lake in the entire Philippines is owed to the Tagbanwa tribe that owns it. The oldest ethnic group in the country, the Tagbanwa of Coron Island are considered the Philippine’s original inhabitants and they take it as their utmost responsibility to protect and take care of their sacred ancestral domains. The tribe don’t allow their lands to fall into the hands of the government and their wishes to stay entitled to ownership are well-respected. Cleverly, they also collect entrance fees from the tourists visiting and keep the place as convenient as possible for the divers. Descending back down from Kayangan, we approached our outrigger boat that was docked next to the huts of the indigenous tribes. We then seated next to a sheltered seating area in the village where we were served a sumptuous, fresh lunch of Pancit Canton and coconut water prepared by our boatman in a cottage perched over the waters. We mingled with the welcoming and friendly locals, recognizable by their dark skin and skinny short-stature. Some offered to sell their handicrafts and shellfish accessories. It was then time to visit the Twin Lagoon. As the name implies, the lagoon consists of two bodies of water separated by a wall of karst. To get to the second, inner lagoon, our diver lead us to a hole that allowed us to swim to the other side. He mentioned that due to the low tide, we were able to pass through. The hole becomes completely submerged underwater once the high tide hits and apparently there is an alternative way to cross over. It wasn’t until that day that I felt I conquered my fear of the deep. The deep, is another world worth to be seen. We were taken to the Lusong Coral Garden, where an astounding stretch of multicolored- fish, anemones, and untouched corals flourished. It was a surreal experience relaxing on the water’s surface, paddling away, as we looked down a motion picture of mother’s nature’s masterpiece; a vibrant underwater world beneath us teeming with thousands of diverse species. We passed walls and walls of never-ending corals, some of luminescent velvet, home to sea urchins and clown fish. There was such a big explosion of interesting sights at every turn that my husband took some photos and videos of the rich marine biodiversity for memories. Some of the best preserved Japanese WWII shipwrecks also exist at Coron Island. This was an amazing experience too. We were taken to the sight of the sunken Japanese vessels known as the Skeleton Shipwrecks. We mostly snorkeled our way there, some laid on the shallow end so staying upright even allowed us to feel the mossy vessel with our toes. As we gazed under the surface, some divers were penetrating it’s interiors overgrown with corals. On our third day, our final destination was Pass Island. After another snorkeling expedition, the Island served as a resting place. It is less visited, due to it’s lack of restaurants, accommodation, and infrastructure. It’s purely a paradise island limited to just a few bamboo huts. The island’s colors were so vivid, it was dreamlike. Powdery white sand, swaying palm trees, and translucent baby blue shores beckoned to us. Even venturing out meters into the sea, the water was still relatively shallow. A boat, van, and plane ride back home. 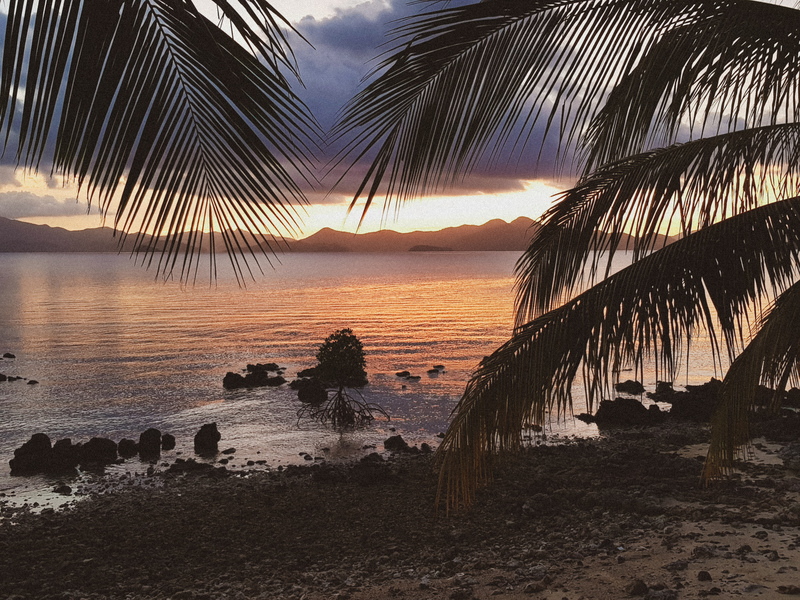 We arrived back to our bungalow to make the most of our last night in Palawan, Coron Island. It was truly magical, even at night. The heavens unleashed their showers every now and then. The early morning that followed, the sun was just beginning to rise and stormy clouds headed our way. It was an immensely rocky boat ride as huge waves crashed against our boat. We were going into “Castaway” mode 😳.